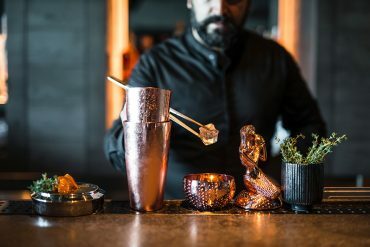 A meyhane is a crucial part of Turkish nightlife, and while on holiday in Bodrum, you will most certainly want to celebrate (many times) at one. But what to do about that glass display counter filled with a kaleidoscope of indiscernible dishes? 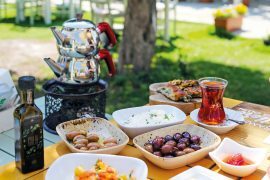 They’re sure to be packed with meze – small seasonal dishes of all assortments and ingredients, meant to be eaten alongside copious amounts of aniseed-scented rakı. All you have to do is choose your nibbles from the trays or glass display counter. The variety may overwhelm, but don’t be shy – choose with abandon. 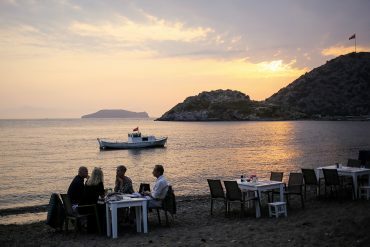 They may be small, but a night at a meyhane often ends without the table ever ordering a main course. 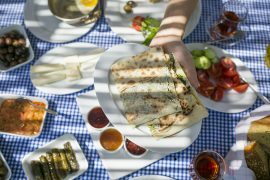 Here are a few favorites to get you started on your way to a true Turkish meyhane night. 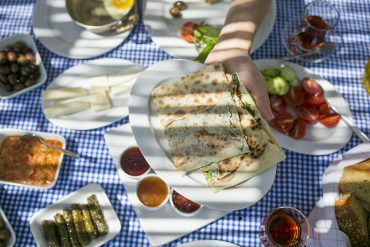 Not all meze are prepared in the form of spreads and salads. Mücver, a type of fritter, is the best example of this. 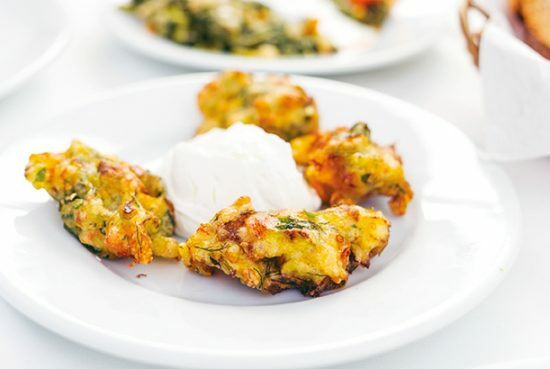 Typically made of zucchini and fried in the form of a pancake, it’s recipe leaves enough room for creativity, allowing the chefs to experiment with shapes and ingredients. 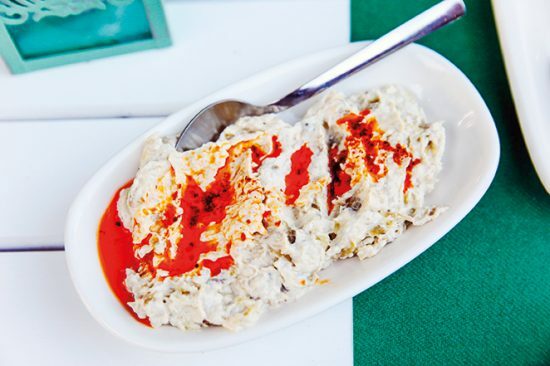 Girit ezmesi is an import from Greek (Cretan) cuisine that has become widely popular in Turkish taverns. 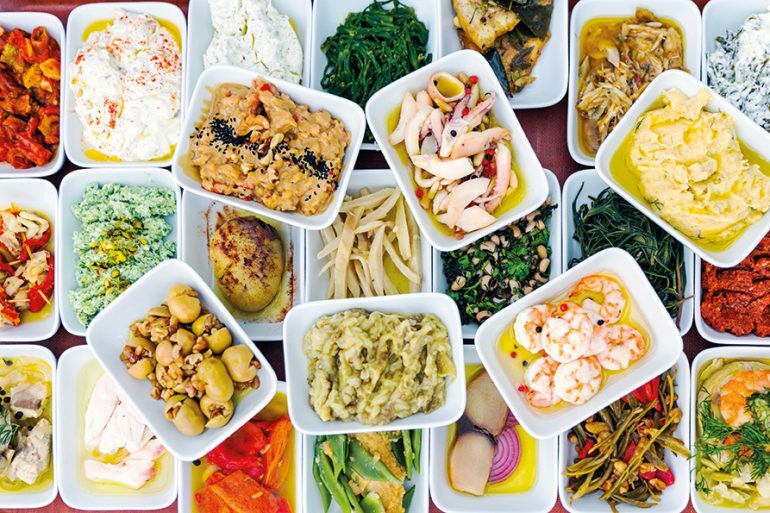 It is a paste made of three types of different cheeses, but it’s the herbs and spices that make its color vary from restaurant to restaurant. 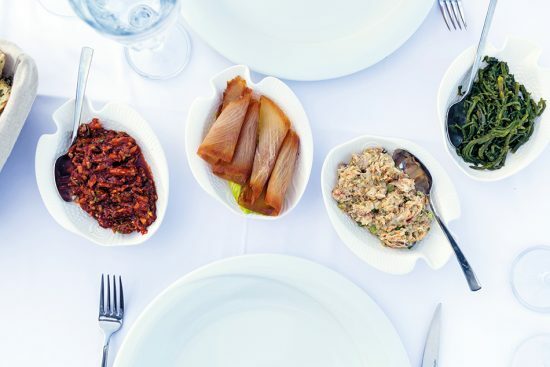 Grilled, peeled, and mashed eggplants are core ingredients of many different meze. 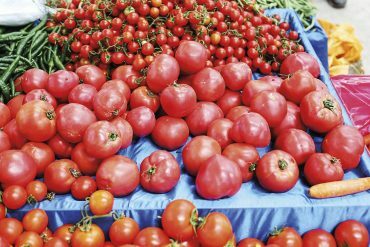 Whether it’s patlıcan ezme (mashed eggplants), şakşuka (shashuka) topped with tomato sauce, or — as pictured here — the southern delicacy of mutabbal, and one can’t imagine a complete table without it silky presence. 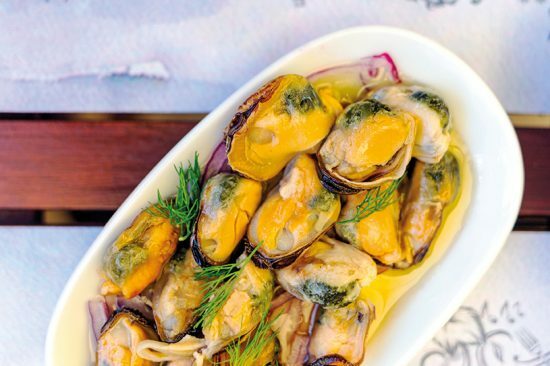 Chances are, you have tried midye dolma (stuffed mussels) sold on the streets. 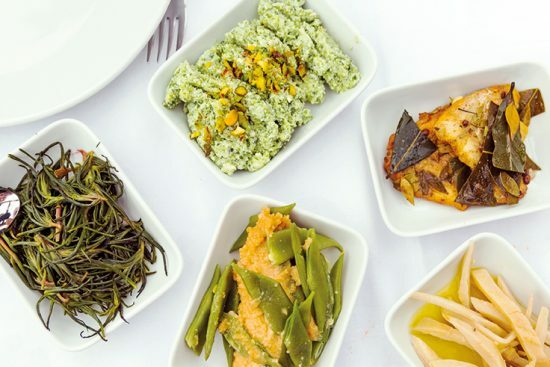 When making an appearance in the meze selection, midye may also come in all different shapes and forms — from brined and fried varieties, to salads. 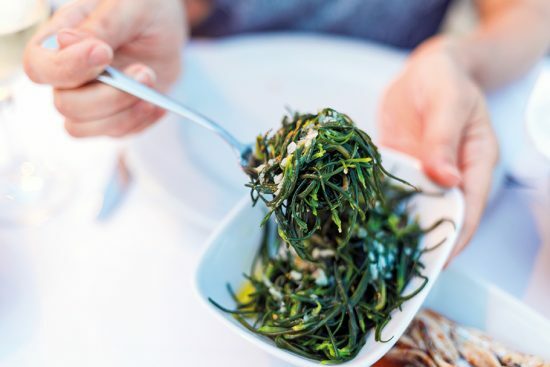 Another green delicacy from the seaside, deniz fasulyesi (sea beans) may look a similar to its sea asparagus cousin (and is often cooked the same way). 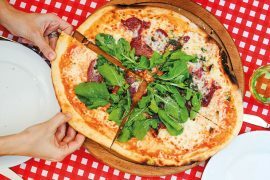 However, its long, thin fronds, tart flavor and fine texture sets it apart. Instead of trying to choose between them, order both if available, and let your palate be the judge. 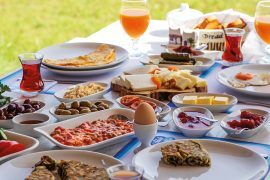 Gıyı Balık Restaurant: open daily from 9am (breakfast service in the morning). Yahşice Mahallesi Yalı Caddesi No.6, Ortakent. In its raw state, it may look like an inedible wild weed. But when cleaned and poached in olive oil deniz börülcesi (sea asparagus) turns into a delicious side dish. 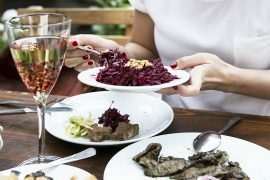 On a meyhane table, deniz börülcesi is usually served with garlicky olive oil. The seasons for this delicacy ends when summer does. 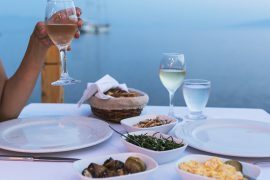 Once you’ve tried all the classics and are looking to up the ante for your tasting experience, head to Bodrum’s favorite meyhane, Bağarası—we assure you the dishes you’ll find there are not to be found anywhere else. 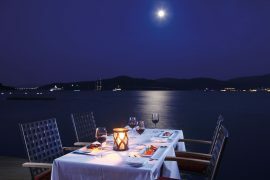 The menu changes on a daily basis, according to seasonal availability, but the surprises never disappoint. Malades is another place where you go to try exceptional meze. 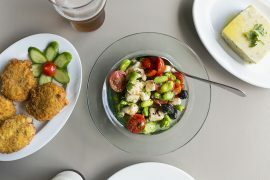 Blending the flavors of Greek cuisine with local ingredients and culinary expertise, the owners, with the help of Ali Ihsan Usta (in charge of the kitchen), will make you come back for more. 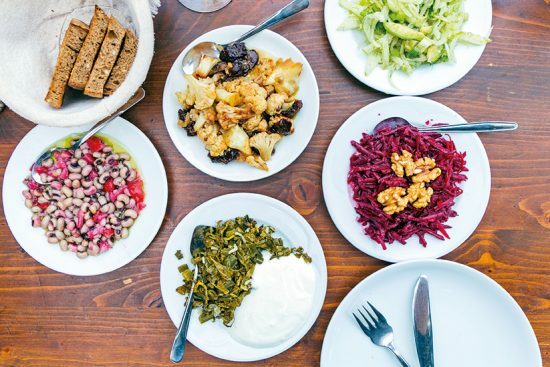 In winter, try cabbage leaves stuffed with chestnuts, calamari meatballs and fish simit. In the summer – grilled calamari rolls, and figs with ice cream. 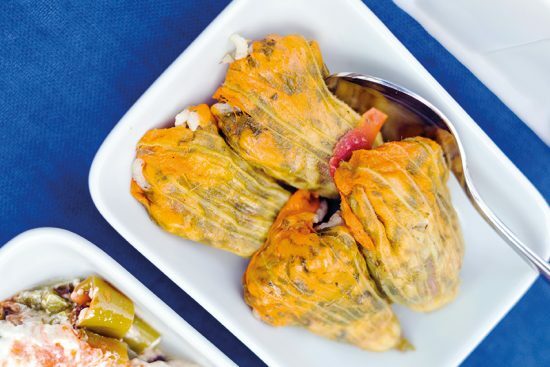 Available only for a short period of time in the summer, kabak çiçeği (squash blossom) is served stuffed with a spiced rice filling, deep-fried or cooked in olive oil. Very light in texture and flavor, the flower allows the stuffing to take the lead on a plate. If you order çiroz, you’ll be served mackerels that are sun-dried, then fried and served with vinegar, olive oil, and lemon juice. The fish might look small, but they pack a flavor wallop. 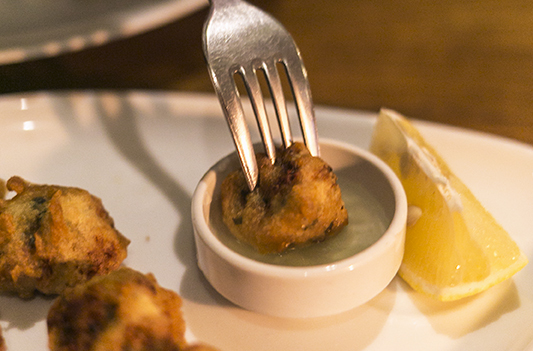 A dish that has been around since the Ottoman times, lakerda often pops up on the tables of seafood lovers. It is essentially Atlantic bonito fish brined for weeks and served sliced with olive oil and seasoned with black pepper.